This is a wheat beer brewed with a lot of Damm spices including licorice, coriander and orange peel. It is just recently being introduced to the US in "Personal Size Bottles." It's been available in wine-sized bottles here, but it's funny b/c I didn't even finish my Damm review yet and already cracked open my second 330 mL personal bottle. Perspective! 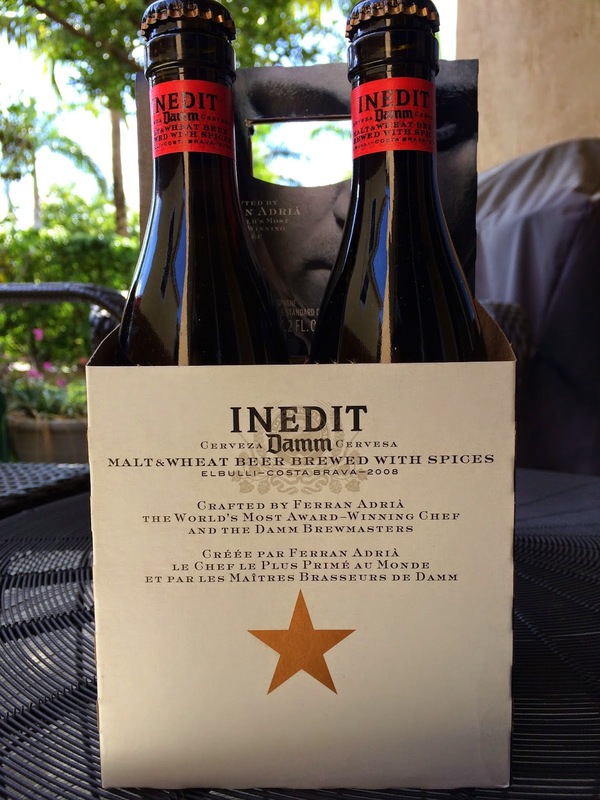 Inedit Damm was created by famous award-winning Chef Ferran Adria and the Estrella Damm brewmasters. I think this is a highlight though I've never heard of this guy despite watching a Damm inordinate amount of Food Network and other cooking shows. 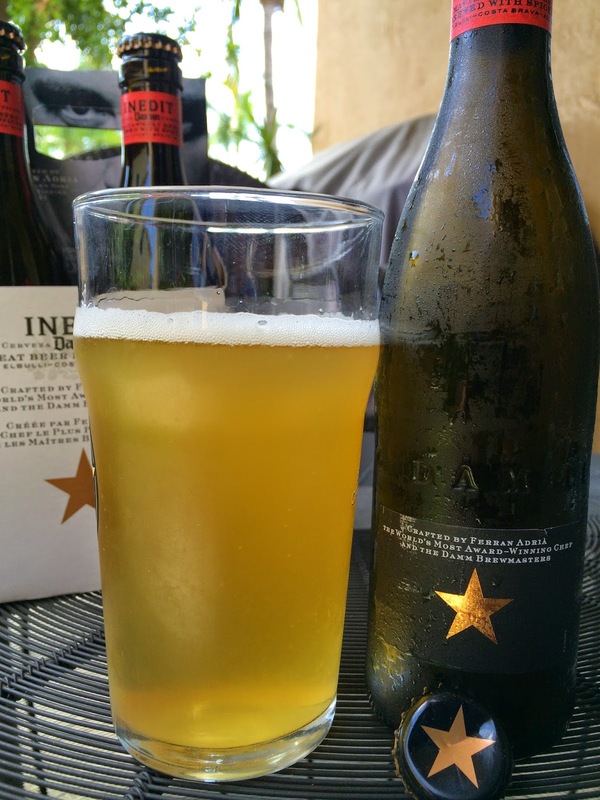 Anyway, given Chef Adria's cooking prowess, this beer was created in such a way that it's extremely versatile and can be "paired with any [Damm] dish." I paired the first two bottles with nothing. I also didn't follow instructions to serve in a Damm white wine glass, no more than half full, so I could fully appreciate the aromatic intensity. Damm (InEd) It! Best Before end of 01/2016. 4.8% alcohol. Damm nice aroma, full of lemon and orange citrus with strong coriander. Sweet wheaty grain flavor start. Wow, plenty of corainder and orange too, accompanied by a nice tangy streak. Carbonation is good, adds to the Damm refreshment. Medium body, not too thin. Inedit Damm does remain on the sweet side despite some grassy hoppy nips and a little zesty citrus. But it's mostly balanced. Pretty Damm easy drinker. Not bad! As I was writing this review, someone retweeted a tweet Alyssa Sutherland sent me (she's the Damm hot actress from the History Vikings show!) 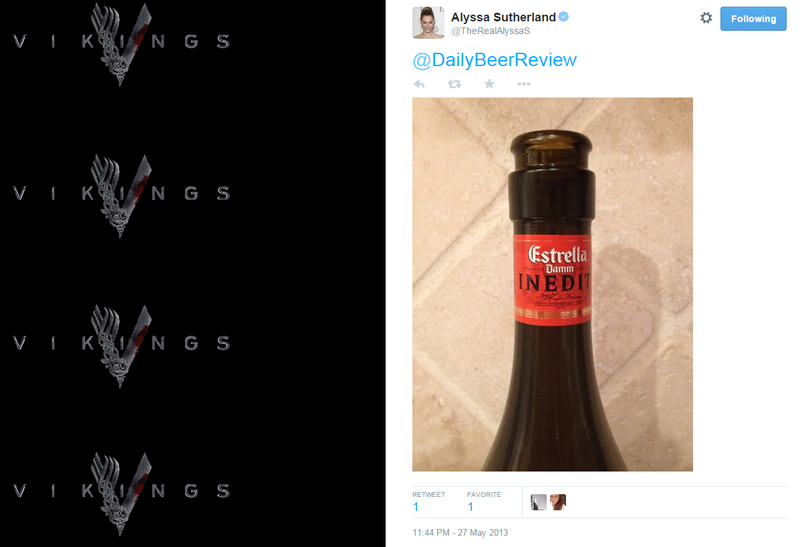 So I tweeted pictures of the new Damm packaging and bottles to Alyssa, considering it's a beer she likes. 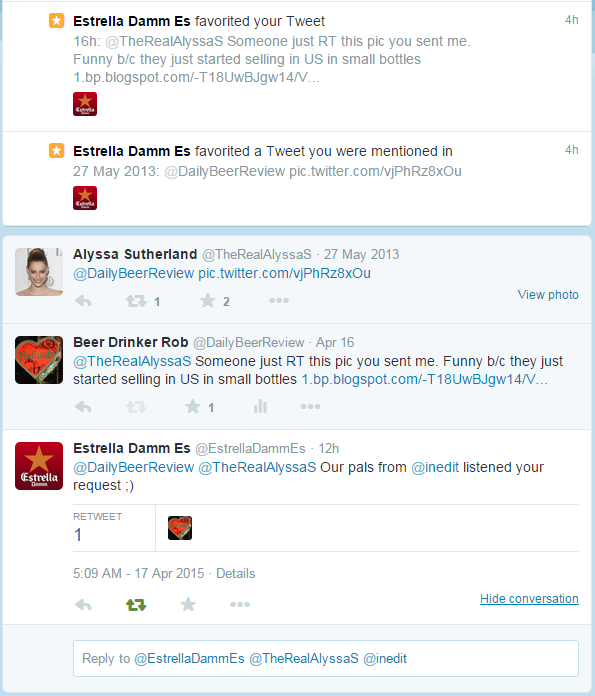 Man, Estrella Damm must be stalking me (see response below). Damm Funny. OK. Done, for now!